On Sunday, March 20, the National Cherry Blossom Festival kicked off in Washington, D.C., to celebrate the traditional arrival of spring in the nation’s capital and the enduring Japanese-American friendship. The latter is represented by the gift of cherry trees from Japan to the United States more than a century ago. The festival attracts people from around the world who come to admire the delicate and fleeting cherry blossoms, planted in large groupings along the Tidal Basin and Potomac River. Classic views of Washington often feature the memorials and monuments rising from a sea of pink and white blossoms. Over the course of four weeks, visitors are invited to a series of programs highlighting traditional and contemporary arts. Luckily, the cherry blossoms and many events are within easy access of Washington Union Station for those interested in a day trip or a longer stay. A 1972 advertisement highlights the TurboTrain on the experimental route between Washington and Parkersburg, W. Va. 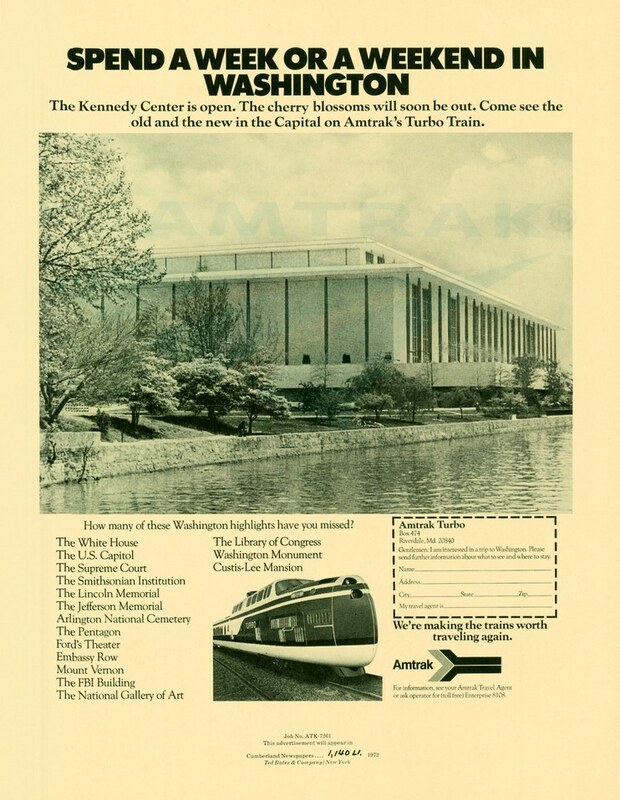 The Amtrak Archives contains a handful of items tied to the cherry blossoms, including the 1972 advertisement above. It was part of a series of advertisements created for Amtrak between 1971 and 1973 by the Ted Bates agency of New York City. According to the text at the bottom of the piece, it was intended for placement in Cumberland, Md., newspapers. In a letter to Amtrak, the agency noted that advertising was placed in newspapers, radio, television and magazines, but the first two were preferred "because of their ability to present local information and immediate impact." The power dome car included seating on two levels. Potomac Turbo route map, February 1972. 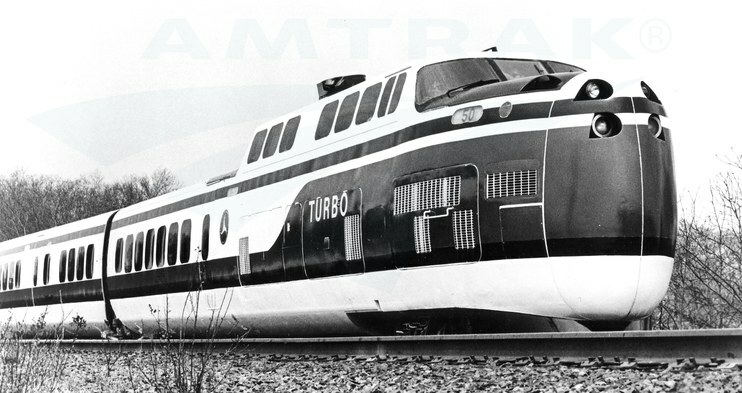 The TurboTrain debuted in Penn Central service between Boston and New York in April 1969, a little more than two years before the start of Amtrak operations.3 The two trainsets built for test service on the NEC were made up of two power dome cars and an intermediate coach that together accommodated 144 customers. The bi-level power dome cars housed six turbines, as well as seating on both levels. They were noted for distinctive, high noses with double headlights. From the seating area in the dome, passengers could directly view the engineer and the controls, allowing an unparalleled look at train operations. Welded aluminum construction made the trainsets light-weight compared to standard equipment then in use, and they also hugged the ground with a low profile. Curving car bodies were designed to be aerodynamic.4 By employing a suspension system that allowed the train to bank into curves, it could operate through them “at speeds 30 to 40 percent higher than conventional equipment.”5 This resulted in time savings, and was especially useful on the tracks that followed the curving Connecticut coastline. Because there was a power dome car at each end, the trainsets could operate in either direction, eliminating the need to reverse the equipment consist or reposition the locomotive at the end of a run. Rather than the typical arrangement of wheel sets on both ends of a car, the TurboTrain had a set of wheels located where cars joined. Doors, which opened and closed automatically, were located at the center of each car, as were restrooms and luggage storage. There were no doors between cars, meaning a passenger could walk unimpeded from one end to the other. Articles highlighted reclining seats with individual reading lights and pull-down tray tables, carpeted floors and tinted windows with curtains.6 A snack bar in the middle of the train offered sandwiches, beverages and light refreshments. After the start of Amtrak operations in May 1971, the new company took over operation of the TurboTrain equipment in its daily runs. That same year, the U.S. DOT and Amtrak sent a trainset on a 31 state national tour. In February 1972, Amtrak assigned one of the TurboTrains to the Washington-Parkersburg route and fittingly renamed the train the Potomac Turbo.7 A brochure from the time proudly declared the TurboTrain “Space-Age High-Speed Ground Transport.” Although it could not run at top speeds through the mountainous terrain, the trainset did cut travel time by more than an hour over existing equipment. 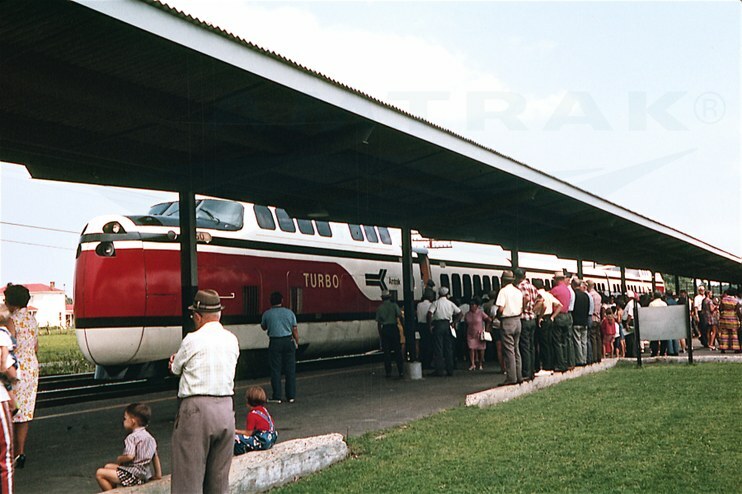 A crowd greets the TurboTrain at Petersburg, Va., during its 1971 national tour. Bruce Goldberg, author of Amtrak: The First Decade, notes that the Potomac Turbo lasted a short three months, as conventional cars and locomotives returned to the route by May.8 A year later, Amtrak ended the experimental route, although a new train – the Blue Ridge – was initiated between Washington and Cumberland. Amtrak added four additional coaches to each TurboTrain in 1972 and subsequently purchased the two trainsets in January 1973. In October of that year, it bought a third trainset with four coaches that had been used by Canadian National Railway.9 The TurboTrains remained in use between New York and Boston until 1976. Cumberland, nestled in western Maryland’s Allegheny Mountains, is today served by the Capitol Limited (Washington-Chicago). It remains a popular getaway for residents of the Washington, D.C., region. Many come to explore the historic city center, ride the Western Maryland Scenic Railroad’s excursion train to Frostburg and take advantage of scenic hiking and biking trails. In downtown, the Great Allegheny Passage, a hiker-biker trail that starts in Pittsburgh, meets the Chesapeake and Ohio Canal National Historic Park, whose towpath leads to the nation’s capital, closely following the Potomac River for much of its journey. Luckily, the Capitol Limited now offers walk-up bicycle service that makes it easier than ever to plan a cycling adventure. Did you ever ride a TurboTrain? Share your memories in the comments section below. 1 William D. Middleton, “Turbotrain revisited: Is there a chance for the Northeast Corridor Project’s stepchild?,” Trains, March 1970. 7 Goldberg, Bruce (1981). Amtrak: The First Decade. Silver Spring, Md. : Alan Books. 9 “First Amtrak TurboTrains Retired, Used in Boston-New York Service” Amtrak NEWS, January 1980. 4.